From June 2 – 22, 2019, Skidmore College will offer an intensive workshop for pre-professional and professional dancers led by STREB Extreme Action. Students will have the unique opportunity to train and perform under the guidance of Elizabeth Streb and her company while enjoying Skidmore’s facilities and the Saratoga Springs community in upstate New York. Attack Theatre is hosting its annual Summer Dance Intensive, Traction, on June 17–21, 2019 in Pittsburgh. The National Center for Choreography at The University of Akron is working on a project that would be of interest to your program. Sunday, March 10 NCCAkron is hosting a series of master classes by Dancing Lab artists. There is space for up to 10 pre-professional and professional dancers from dance programs to come and participate in these dance classes free of charge. More information is to come, but feel free to look at other events in this residency on the webpage. UNCSA Summer Dance is comprised of four Intensives, three Professional Development programs and one Choreographic Residency, providing gifted emerging artists with the experience, knowledge, and skills needed to excel in their disciplines and in their lives. Consisting of eight separate programs, UNCSA Summer Dance fits the needs of serious dance artists at any point in their training or career. Stuart Pimsler Dance & Theater’s (SPDT) Radical Access is a PAY AS ABLE week-long residency. Radical Access invites applicants to imagine new ways to engage their communities with SPDT’s facilitation at a cost that fits the applicant’s needs. cutting-edge artists in contemporary modern dance! Six distinct programs were announced today by The School at Jacob’s Pillow, where performers and choreographers will be mentored in developing their uniquely resonant voices in Contemporary Ballet, Flamenco, Contemporary, Tap, The Ann & Weston Hicks Choreography Fellows Program, and Art of Photographing Dance. View the full press announcement or visit our websitefor more information. Program artist faculty, application requirements, and scholarship opportunities will be available online December 3, 2018. Barnard College January 2-7, 2019 for our annual NYC Winter Intensive! Register by October 26th and save $100 off the registration fee! Our NYC Winter Intensive gives dancers tools that deepen their creative practice. Each day begins with a technique class taught by David and the Company. The day continues with workshops which explore David’s trademark style of merging highly athletic physicality with theatrically-based text exploration. Daily choreography labs explore the creation of personal movement and evenings are opportunities to watch the Company in Open Rehearsal. Grow as a collaborator and leader in socially-engaged dance making through daily movement classes, research, creative process, and by sharing tools and practices. Continue exploring core practices through the creation and public performance of a new work. For questions or inquires, please reach to Sam Horning at samh@danceexchange.org. This six​-day workshop will be jam-packed, offering in-depth technique and repertory classes, as well as workshops in improvisation/invention, performance concepts/qualities, partnering, site-specific explorations, and yoga/body work. Unlike many intensives, we keep the numbers low in order to offer students a more personal experience. Classes run from 10am to 6pm Monday through Friday, with a later start for Saturday am​. Optional activities are scheduled almost ​every evening! Students in the Group Study Program learn from Gibney Dance’s renowned faculty and working artists during their stay, in a range of contexts: master classes, panel discussions, curated performances, and more. This experience is ideal for groups from universities and schools looking to dive deeply into the NYC contemporary dance scene. Residencies are 100% customizable, and can range from one class, to one day, to two days or more. Programs are priced according to content; starting at just $700. Gibney Dance offers four and eight week programs each summer through NYC Summer Study, and a two week program each January through NYC Winter Study. Summer and Winter Study offer students a perfect opportunity to explore the NYC dance community. Students take class with our world-renowned faculty, see cutting-edge performances, receive individual attention from program staff, and deepen their engagement with the field through panel discussions, seminars, and more. Gibney Dance’s Professional Training Program offers students from around the country an opportunity for focused, immersive study at Gibney Dance in New York City over 3, 6, or 12 months. Participants create their own schedule from Gibney class offerings, and must complete 22 instructional class hours weekly. Students take class alongside NYC professionals and are offered access to studio space and opportunities specific to their chosen tracks. Join a group of Africa enthusiasts and performing artists to travel around Ghana and receive state of the art dance training from some of Ghana’s most accomplished dancers and musicians. Study traditional Irish dance by immersing yourself in the two-week intensive Blas summer program offered by the Irish World Academy of Music and Dance. Summer courses are offered in 3-, 6-, and 12-week sessions. For a breakdown by session, visit the Academic Calendar. Exact dates for each course are listed in the Albert Course Search. Doug will share ideas about craft, design and composition through finely honed creative games and devices in which an abundance of material is built quickly then carefully shaped and molded. Participants will create studies using dancers selected by Doug and the Company. Company members will serve as guides and moderators throughout the week. Please note that DEVICES is intended for emerging choreographers who have already begun making work in the field. Current MFA students will only be considered if they have already established themselves as professionals outside of their master’s program. Undergraduate students will not be considered. ArcDanz would like to offer you six half tuition scholarships for this summer’s program. It is an excellent opportunity for dance students to continue their professional training with internationally accomplished faculty whilst gaining an experience abroad deeply rooted in cultural immersion and artistic exchange. Classes include ballet, yoga, somatics, music theory, ArcTalks, and varied modern techniques and repertory. The program culminates with performances of the works in progress created during the repertory sessions at both the university and the prestigious Museo Soumaya in Mexico City, an exquisite space providing dancers a unique spatial experience. Intermediate and Advanced dancers, pre-professional and professional, ages 16 and up. College-aged through professional dancers are invited to join us in Cincinnati, Ohio for a week that is all about Modern Dance. Registration Discount Deadline: April 1, 2016. Intermediate and Advanced students accepted ages 11-22. SaltDanceFest brings together internationally renowned artists and dance makers for two weeks of moving, collaborating, dance making and the lively exchange of ideas. With participants from around the country and the world, the workshop is designed to be a laboratory that nurtures and supports experimentation, exploration, curiosity, collaboration and the development of innovative choreography. SaltDanceFest offers classes in contemporary technique, composition, repertory, performance, improvisation, somatics, writing and partnering classes as well as performances and other events. A 2-week choreography and dance intensive — technique and choreography classes, workshop panels, music and dance concerts, and performance opportunities for local to international dancers and choreographers. Under the guidance of professionals in the field, choreographers and dancers will work together while collaborating with music composers. Their collaborations will be premiered in concert as a series of original, seamless music and dance pieces. Kim Robards Dance is a professional modern dance touring company based in Colorado. Module is semi-annual six-day incubator for advanced and professional artists in New York City with the critically acclaimed Sidra Bell Dance New York, inviting them into the intimate creative culture of the company. Artists have the opportunity to interface with the artistic director to deepen their approach to the material and its unique methodology. Various intensives offered in Ballet, Contemporary, Improv Traditions and Musical Theatre. Applicants may audition in person or submit a video; there is $15 application fee. Inlet Dance Theatre’s Summer Dance Intensive is an aggressive six and a half week training program for ages twelve through young adult. SDI focuses on increasing technical skill sets, collaborative creative process, performing improvisation and repertory. SDI allows students to experience being a dancer in a professional dance company. SDI students will learn nontraditional partnering, Hawkins-based release technique, performance improvisation, composition, and repertory. SDI takes place in downtown Cleveland in Playhouse Square’s beautiful studios and culminates with performances at Cain Park Evans Amphitheater. For dancers 16 years+, ADF is the Six Week School (6WS), where dancers from around the country and around the world come to train and to create, to see and be seen. Over the course of the festival, students of all levels work each day with ADF’s diverse faculty, extraordinary musicians, and vibrant student body to create rewarding, life-changing experiences. The six-and-a-half week commitment results in the enduring, hard-won benefits that only long-term training can yield. In the 6WS, you’ll: build your technical foundation, taking core classes in modern technique, improvisation, composition, ballet, text in performance, hip hop, and more; perform, create, and share your work through the Footprints program, International Choreographers in Residence concert, student concerts, and class showings; and learn existing repertory and create new works in repertory classes. The Dancing Wheels Company & School will be offering a two-week Adult Summer Intensive Training for dancers 15 years and older. We will take participants on a step-by-step guide of how to perform and teach our specific technique. This workshop may also serve as an opportunity to audition potential trainees and apprentices for the Dancing Wheels Company. New this year, our second week will focus on our teacher-training manual, ending with the award of a certificate of completion. The intensive takes place in Chicago, IL and is open to pre-professional and professional dancers aged 11 and older. Classes offered in Ballet, Modern, Jazz, Contemporary, Pilates, Afro-Cuban and more; scholarships and work-study available. FlorenceSummerDance is a summer dance intensive bringing world-renowned Faculty and dance students from around the world. Our goal is to develop weel-rounded dancers through exposure to a variety of disciplines, with emphasis on modern and contemporary dance. Designed for pre-professional dancers to seasoned choreographers and performing artists, FlorenceSummerDance is also a fantastic opportunity for dance educators to revitalize, re-examine, re-charge, and expand teaching methods. Movement Invention Project (MIP) is a unique three-week summer intensive in New York City for advanced dancers, 18 to 23 years old. Dancers will work with an extraordinary faculty of teachers, choreographers, and mentors in a Project that encourages risk-taking, creativity, and the development of improvisational skills. In this supportive environment, dancers will be prepared to work in collaboration with today’s choreographers. The program includes ballet, improvisational workshops, and the exploration of the creative process. Immerse yourself in the music and dance of Bali. Three weeks of intensive study of Balinese gamelan and dance – an experience you will never forget. Çudamani (pronounced soo-dah-MAH-nee) welcomes both beginning and advanced students, with a system of teaching that provides newcomers with foundational skills and which also challenges advanced students and performers to deepen their artistry and expand their repertoire. Be prepared to work hard, laugh a lot, make friends and have your life changed. The summer school takes place in the green heart of Austria- located in the southeast of the country. Participants stay and work at the territory of the 15th century castle, which is today the modern international arts centre. Participation fee is 550 EUR (early bird reduced fee) / 650 EUR. Accommodation is organized in shared twin/single rooms at the castle guest house (7 nights), 3 meals per day are available for the group. This workshop provides a unique opportunity for pre-professional dancers to work directly with one of the generation’s most dynamic and provocative choreographic talents. The Workshop offers a rigorous dance experience in a supportive atmosphere, fostering a creative exchange of ideas, encouraging exploration, and providing the opportunity to experience a diverse spectrum of dance/movement disciplines. Dancers expand their skills through daily classes, workshops, discussions, informal showings and performances. Four, week long Master Class workshops accompany a core technique schedule, each taught by a prominent artist/teacher currently working in the field. The program is designed for intermediate and advanced level students, ages 18+. Class size is limited in order to maintain the quality of the learning experience. Summer Intensives are open to dancers in high school and college/university from all over the world and consists of enriching dance classes, social activities and much more. The Summer Intensive includes four technique classes daily comprising of classical ballet, modern/contemporary dance, company repertoire, body conditioning, as well as workshops in a variety of dance styles. 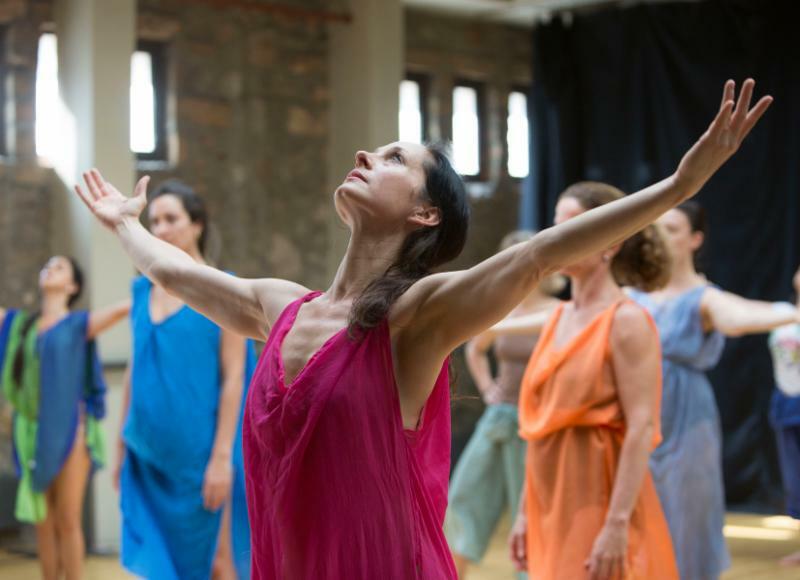 Summer MELT includes five weeks of diverse approaches to movement practices as well as tools for composition and improvisation, in the heart of New York City. Summer intensive geared for students ages 17-24. For performers, musicians, vocalists and dancers. The TDC College/Pro Intensive is designed for advanced, semi-professional, and professional dancers ages 18-25. Vin Vigor’s Summer Program is in response to the need for contemporary dance-theater based education in New York City. The program is anchored in Gillen’s commitment to activating the whole of the performer, from the extremes of virtuosic dance to the fluid awareness of emotion and experience. The program will include classes that focus on contemporary dance with VIM’s signature full-bodied aesthetic in combination with complex floorwork, partnering, acting, improvisation,meditation/awareness, bodywork/massage, roundtable community discussions, and a creative process with Shannon Gillen. .
Auditions take place in Portland, Salt Lake City, San Fransisco, New York and Chicago. The intensive takes place in Portland, OR at Portland State University and is open to students ages 14 – 22 years of age. Dance Theatre of Harlem’s Summer Intensive programs are challenging multi-week sessions designed for students at various proficiency levels ages 8-24. The diverse curriculum, with a focus on classical ballet and a variety of dance disciplines, ensure students leave our programs technically stronger, broad minded and inspired. Students are placed by our artistic faculty in one of three programs for maximum development. Acceptance is by audition only. Intensive is geared to young, aspiring graduate students who have completed a professional training program. International Summer Dance Intensive in is collaboration with Arts Umbrella. Applications are online only, and spots are first come, first served.